Stephanie Cox | Why Not Train A Child? The best sale for the book, “Gentle Firmness” through Monday, Dec 12. 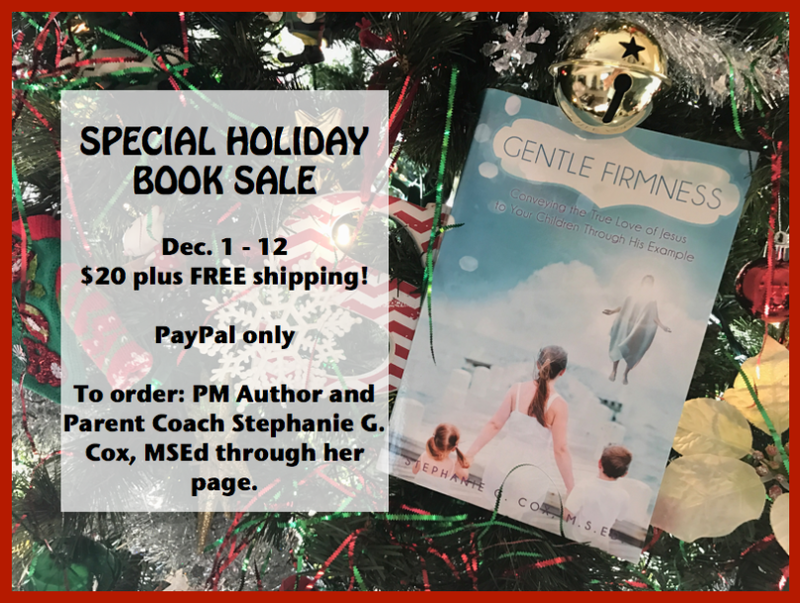 Stephanie Cox is selling signed copies for her book “Gentle Firmness” at the lowest price ever, only $20 with FREE shipping! You still have 2 days to take advantage of this wonderful opportunity to buy this book for yourself and as Christmas presents. In order to take advantage of this sale you need to contact Stephanie directly. You can message her through Facebook or email her at GentleFirmness2014 (at) hotmail (dot) com. For more from Stephanie Cox, please see her articles here. Dara Stoltzfus has started a new series about our very own Steph called, “Life with Cerebral Palsy” with Stephanie Cox. Maybe you saw Steph’s series which previewed here in 2011. It started with, Spanking is NOT God’s Will, followed by The Christian History of Spanking, The Effects Of Spanking and ended with Discipline Without Harm. Well, she has turned it into a Gentle Parenting book which is now available! You can either order the print version or download e-book here. If you would like an idea of what the book is like, there are still a few chapters of her rough draft here. Congratulations Steph! May God be glorified. Note from Hermana Linda: This is the continuation of a conversation in the comments of Steph’s article on Attachment Theory. Read Part 1 here. This exchange starts here. Hi Steph, thank you for your kind reply. I totally see your point. I didn’t mention the details on how my child responds when separated. She ofcourse resists a bit but goes back to normal play within a minute or two. Getting back together is a happy time for both of us but she doesn’t need extra attention but she is loving as always. I can only speak from my own experience and I am trying to find the truth without any bias. When you say brain damage, I can’t understand that because my daughter met all her developmental milestones 6 months ahead of her peers and she is nearly 4 now and has even started reading. I often see how totally she trusts me to keep my word and to take care of her if she is in any kind of danger. I understand God doesn’t want us to cry as it makes him sad as well. But I do see in so many peoples lives that God allows some painful experiences so that they will shine even more brightly for His glory. When we did sleep training, we did make sure that she is completely safe, fed, changed and comfortable and we watched her through the video monitor to make sure her safety. Sure it was hard for us and hard for her. And I wouldn’t do it for a minute if it was not beneficial for her. That training has just done her so much good that she became more fresh and attentive during her wake times and happier. Note from Hermana Linda: We appreciate getting comments and read every one. This comment from Jo about Attachment Theory elicited such an insightful response from Steph that I have decided to highlight it here. From my personal experience with my own child, if you provide consistent care and love in meeting the needs of the child throughout the day, a little sleep training at night develops an even healthier attachment. My child is the most securely attached child I have seen because she is able to stay away from me without much distress as long as I tell her beforehand and also comes back to me with even more love when i get back to her. Crying it out works perfectly but should only be done if the parents are able to provide love and care for the child and securely attach in every way. We did sleep training for her when she was 9 months old and within 3 nights, she started sleeping through the night and sleeps in her own room. She is a very happy child then and now.